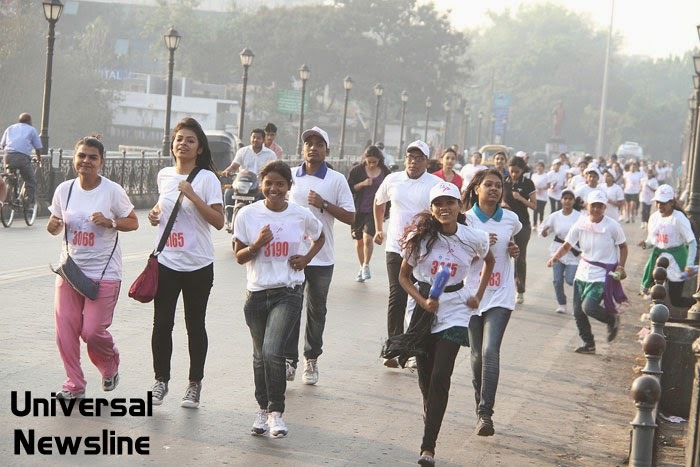 Pune’s youth gathered at 6:30 am on a Sunday morning, to participate in ‘Femina’s Run for a Cause’. March 16th, 2014: The initiative started by India’s largest and most widely read women’s lifestyle magazine for women saw a great support from the city’s youngsters. Kunal Kapoor, whose online fund raising venture, ‘Ketto’ has helped in kick-starting Femina’s initiative, flagged off the run and motivated and thanked the marathoners for their participation. The Run for a Cause saw a lot of support by the presence of celebrities like Pooja Mishra, TV actor, Manav Gohil and rapper Ali Mirza. Manav encouraged the marathoners and also mentioned how he empathised with the cause and is a proud father to his two year old daughter. Coreena Manuel, Regional Editor Femina, India, (Pune) recalled her fond childhood memories of growing up with a brother without any gender bias. Mrs. Usha Kakkade from the USK Group also extended her support to the noble cause, by her presence. The event, a first of its kind, was a great success and saw a participation of about 1000 marathoners, with almost 500 being young adults between the ages of 14 to 18 years. The event ended with the felicitation of the 6 winners (3 men & 3 women) in the 3km and 6km runs each. Vishal Silimsar was the first to finish among the men in the 6km run and Sandhya Kamble among the women. Prathmesh Paithankar finished first among the boys in the 3 km run while Gunjal Arti Ravindar was first to finish among the girls. It was truly heart-warming to see the enthusiasm of the city’s young blood in the wee hours of a Sunday morning. It is wonderful how the upcoming generation is aware and willing to pledge their support and time for causes they believe in. Their spirit and participation has truly added brightness to the festival of colours- Holi, and made it a memorable one.